A friend once raised an eyebrow at me when I mentioned that I’m making latkes tonight for Chanukah. “You’ll eat latkes?” he asked incredulously. As a matter of fact I do, thanks to a simple rule espoused by Michael Pollan: if my great grandmother would recognize it as food, then it’s fair game. Now, I knew my Great-Grandmother Belle well, and I have a feeling she ate a lot of latkes. And she lived to almost 106. 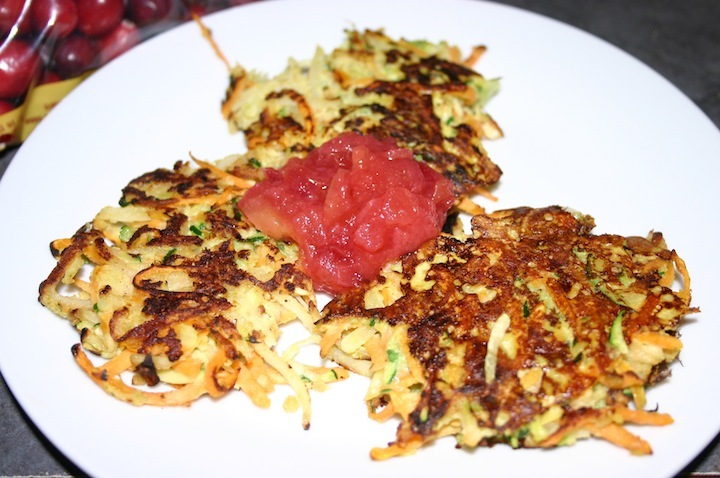 She probably didn’t make latkes like this, but I have a feeling she would have liked ’em. Happy Chanukah! Combine all the ingredients in a large mixing bowl and fry each batch in about 3T of neutral oil until crispy brown. Pat the oil out with a dish towel. Serve with applesauce or sour cream.